Felix Baumgartner jumped from the edge of space 24 miles above the surface of the Earth on Sunday. This is the highest and fastest jump in human history; he ultimately reached 833.9 miles per hour, Mach 1.24. Baumgartner is the first human to break the sound barrier without a plane surrounding him. He broke altitude and speed records set half a century ago by Joe Kittinger, now 84, a retired Air Force colonel whose reassuring voice from mission control guided Mr. Baumgartner through tense moments. Engineers considered aborting the mission when Mr. Baumgartner’s faceplate began fogging during the ascent, but he insisted on proceeding and made plans for doing the jump blind. That proved unnecessary, but a new crisis occurred early in the jump when he began spinning out of control in the thin air of the stratosphere — the same problem that had nearly killed Mr. Kittinger a half-century earlier. But as the atmosphere thickened, Mr. Baumgartner managed to stop the spin and fall smoothly until he opened his parachute about a mile above the ground and landed smoothly in the New Mexico desert. “We’re testing new spacesuits, escape concepts and treatment protocols for pressure loss at extreme altitudes,” said the Red Bull Stratos medical director, Dr. Jonathan Clark, who formerly oversaw the health of space shuttle crews at NASA. 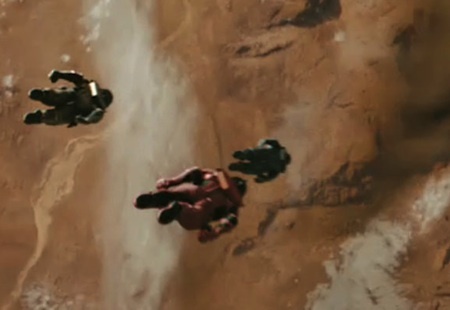 The 2009 remake of the Star Trek franchise contained a dramatic leap from space. ...He curled up into one half of the ball; the other half closed over him and locked. The hatch opened. Ball and closely-prisoned man plummeted downward. And as the ball bulleted downward on a screaming slant, it shrank! I'd also like to point out that I've turned comments back on and the contact form is also open.